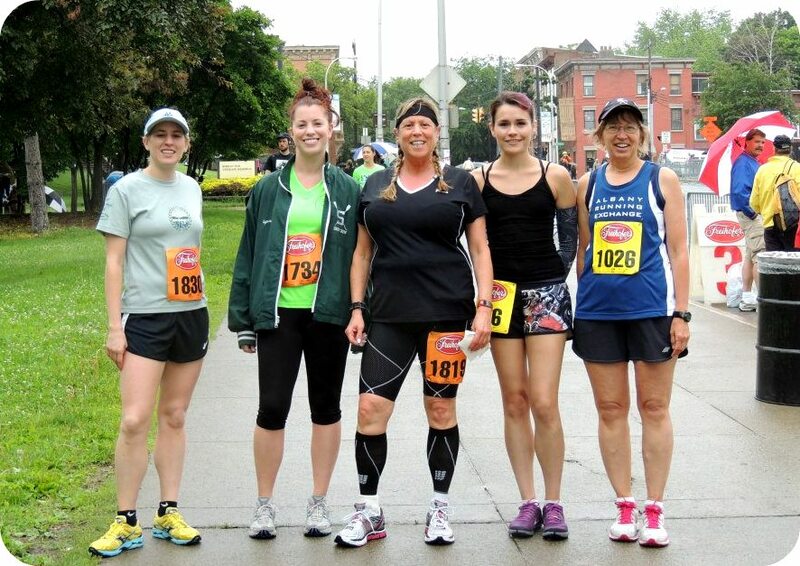 Yesterday was the 34th Annual Friehofer's Run for Women. Yes, this is a women's "run for wellness" sponsored by a bakery and the participants get boxes of cookies and loaves of bread. Makes total sense, right? My first time running this race was 3 years ago when my mother coerced me into signing up with her, she being on a health kick and all and needing to drag someone along with her on her torturous journey. However, after signing me up for the 3rd year in a row my mother did not run this race because she has a booboo. I don't know what it is about this race but I always hurt myself. In exactly the same place. I'm kind of irritated because I was expecting to PR at this race - which I did, but not by as much as I wanted to. The weather today was mid 60s or there about and a pretty constant drizzle. It was like a stagnant mist. You could literally see the water suspended in the air. For many people this is perfect running weather, nice and cool, no crazy heat or dryness. For me it's the worst. I don't know what it is but my lungs just do not function at their full capacity in 100% humidity. this hair is pretty ridiculous, i think it needs to go. also, this is my friend jen. our moms are bffs and we were born a day apart. 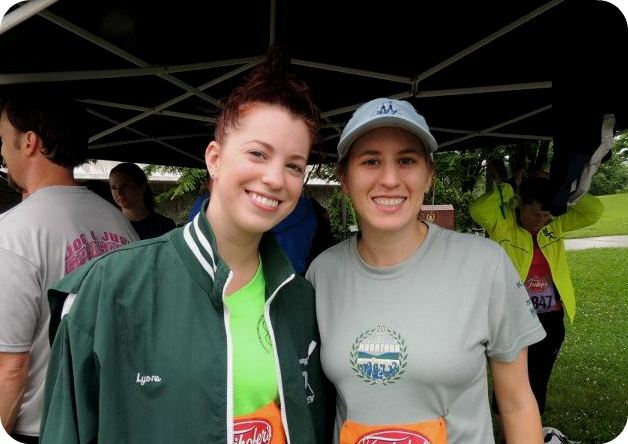 except for me running a sub 30min 5k is an accomplishment, whereas jen recently ran a 50 mile ultra marathon. Dudes, I even did a warm up for this race. And it felt great! A nice light job at a conversational pace, I didn't even feel it. I have never warmed up in my life for a race but I probably ran at least 1k or so and then stretched a bit - things were looking kind of good. And then I stood in the line up for 20 or so minutes while everyone and their mom had to speak. Unfortunately, by the first 1k I had a serious muscle stitch/cramp in my diaphragm and was gasping for breath. I think I got maybe 4-5 full deep breathes the entire race, no joke. I forgot my GPS but I think I can safely say that my pace gradually dwindled as we neared the finish line because I more or less wanted to collapse on the ground and steal the a 90 year old spectators oxygen tank. As I write this post almost 12 hours later my side is still killing me. wtf dudes? The best thing about this race is that the rain kept many of the walkers away, making for a less crowded race. Although the new line up system that was introduced last year might have also played a part in having to dodge fewer walkers and slow pokes who place themselves at the front of the starting line and then straight up walk. I still had to do some maneuvering, but it was less of an obstacle course than usual. Oh, btw, I ran this race in 29:16 - I was shooting for something in the 27-28 minute range, which had I been able to breathe I think I would have accomplished. My next shorter race is the Firecracker 4, which I'm hoping to do in under 39 minutes. This morning I attempted to get up and go to bikram at 8am. I woke up but never made it to bikram. I'd probably be more inclined to go if it wasn't a 30 minute drive. Bleh. Instead I slept in a bit and then went on a short 3 mile or so recovery run at an incredibly slow pace. I don't know what is up but my cramp from yesterday is still killing me - I don't think I can take any of the twists required in bikram or vinyasa but I might give yin yoga a shot tonight, I could definitely do with some deep stretching. Here are a few photos from this morning's run. I just ordered some new running shoes from 6pm (my first time ordering from them last night) last night and I'm super excited. And isn't worn out old school playground equipment totally creepy at times?